Writers love to lampoon poets. They’re easy targets: the disheveled hair, heavy drinking, unconventional manners, and thrift-shop tweeds… Are the stereotypes true? Horace thought so. He caricatured pretentious poets in Ars Poetica (The Art of Poetry). (You can read my posts here and here.) And I was astonished this week to find similar observations about poets in Juvenal’s Satires and Dostoevsky’s Demons. I’ll start with Juvenal, who wrote in the second century A.D.
Will I always be in the audience? Will I never get revenge, after being tormented so many times by the Thesiad of hoarse Cordus? Will one poet have recited dull comedies, another elegies, and go unpunished? Will a poet have wasted my whole day by reciting his great Telephus or Orestes, which he scrawled in the margins and then continued unfinished on the back of the book? I have been to a few readings like that. And Juvenal is so funny! Dostoevsky also raves and rants in his novel Demons about bad poets, who he says flourish in times of social unrest. He wrote Demons partly to respond to what he regarded as romantic portrayals of the nihilists in Turgenev’s Fathers and Sons and the revolutionaries in Chernyshevsky’s What Is to Be Done? Dostoevsky fulminates about the times and the mores. Yet the most worthless fellows suddenly gained predominant influence, began loudly criticising everything sacred, though till then they had not dared to open their mouths, while the leading people, who had till then so satisfactorily kept the upper hand, began listening to them and holding their peace, some even simpered approval in a most shameless way. He then lists many, many different kinds of people who offend him, the military, the lawyers, the divinity students, and the feminists, and here’s what he says about writers and poets. People like… Gogol’s Tentyotnikov, drivelling home-bred editions of Radishtchev,….poets of advanced tendencies from the capital, poets who made up with peasant coats and tarred boots for the lack of tendencies or talents…—all these suddenly gained complete sway among us and over whom? At a literary fete, the pompous Karmazinov, a caricature of Turgenev, gives a long, monotonous reading from his new bad book. This is followed by an incendiary speech by a liberal humanist of the older generation, and then a revolutionary poem by a drunken madman. Watch out for those literary readings! My Russian Lit 101 Office! The Russian Lit Office: My Bed! My Russian lit office is set up for the winter. Actually, it’s my bed. What pastime can you find that’s pleasing? Out in the backwoods? Walking? Try. For all the countryside is freezing. Here’s how Russian lit-crazy I go in winter: this week I’ve reread three Russian novels, Gogol’s Dead Souls and two by Turgenev, The Home of the Gentry and First Love. And I recently found an old college notebook (that tatty green thing in the snapshot above) with my notes for a class in Russian Literature in Translation. My sketchy notes are strangely touching–I do like myself as a young woman discovering Russian literature–and have also inspired me to go back to the nineteenth century. Is the novel really about generational split? In what respects is Bazarov a positive hero? Is Bazarov a victim or suicide? Dostoevsky spokesman for conservatives: THE Christian writer, but also convincingly presents views of radicals. Polit left to polit right, possibly because of experiences in prison. Question of existence or non-existence of God. intellectual and moral honesty in novels. religion helped him endure his hard life. Belinsky thought D’s works should do for Russia what Dickens did for England. Could I possibly have elaborated on those topics! What was I thinking? I can only hope I read the introductions to my Dostovesky books! To supplement my erratic notes, I got out Nabokov’s Lectures on Russian Literature. He did not like Dostoevsky, who was never one of my favorites. My position in regard to Dostoevski is a curious and difficult one. In all my courses I approach literature from the only point of view that literature interests me–namely the point of view of enduring art and individual genius. From this point of view Dostoevski is not a great writer, but a rather mediocre one–with flashes of excellent humor, but, alas, with wastelands of literary platitudes in between. And here I thought it was just the translations. Well, perhaps I’ll try the Pevear and Volokhonsky translations. Or perhaps I’ll skip the rereading of Dostoevsky. My Horse Came in Second, Russian Translators, & Did Dickens Meet Dostoevsky? We got home just in time to watch the Kentucky Derby. Every year it starts when–5:25?–and I watch the horses and jockeys and pick my winner. 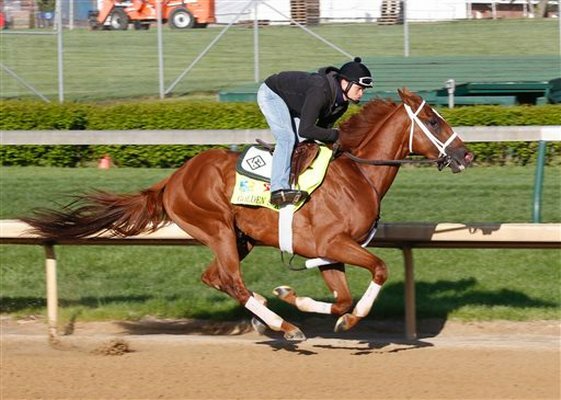 I picked Golden Soul minutes before the Kentucky Derby started. He was such a long shot that everyone thought I was being stubborn for no reason. Now if only I had bet–there’s win, place, or show–I could apparently have made some serious money! 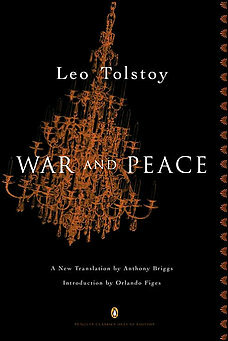 I am reading War and Peace for perhaps the seventh time. At my house the general opinion is that reading War and Peace may save my mind from the internet. Blogging is bad enough, they think, but far, far worse is Twitter. If you don’t believe I prefer Tolstoy to Twitter, let me tell you that I even love his shorter works. You think Tolstoy’s Resurrection is bad? Try me. I’ve read it and will be happy to read it again. Many novels and stories by Tolstoy have been translated in recent years to great acclaim. When Oprah chose Richard Pevear and Larissa Volokhonsky’s Anna Karenina for her book club, no one thought anybody would read it. May I just say that my book group, who aren’t always reading Tolstoy, read and loved it? In the March/April edition of of Humanities, Kevin Mahnken interviews Richard Pevear and Larissa Volokhonsky about their translations of Tolstoy and Dostoevsky. 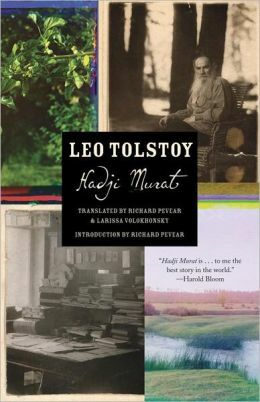 They have finished Tolstoy’s major works: Hadji Murat was the last they translated. The married couple’s process is interesting: Volokhonsky, who is Russian, translates the Russian word for word, and then Pevear, who is American, smooths it out into literary English. They started with Dostoevsky’s The Brothers Karamazov, because they thought a new translation was needed to convey the humor and irony. The couple are thinking about translating Turgenev: I hope they do. 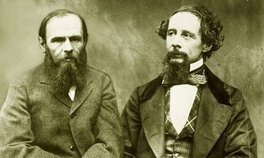 In the TLS, Eric Naiman’s article, “When Dickens Met Dostoevsky,” will divert both Dickens fans and Dostoevsky fans. But it seems that no one quite knows where this letter is. Hmmm. Was it a hoax?